Just a quick turn down a winding road from the wet trainer, another group of Sailors prepared themselves to save the ship as well. Only, their potential danger would not be water; these eager Sailors would face a dark room full of smoke and scorching, blistering fire. Soon both sets of students would be struggling to accomplish two completely different tasks. There may be nothing as out-and-out diverse as fire and water, but in completing their independent tasks, the Sailors are working toward one common goal–attempting to move on. As students at the Navy’s Basic Enlisted Submarine School (BESS), students have long been faced with the stress and strain of this final week of training. The trainers serve as the final obstacle for the wannabe submariners before BESS graduation, capping off a month-long learning process. Adding to the stress of the event is the jam-packed aspect of the week’s training schedule. Prior to the groups’ final scenario, they spend two days training and performing in the wet trainer. The relatively quick pace of the hands-on training proved to be another barrier for the students to cross. 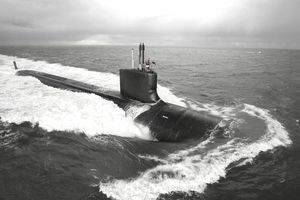 The pace of the final week seemed to mirror the prior three, in which Sailors–most straight out of boot camp–began to lay the groundwork of becoming a submariner. The path starts just before classing up for BESS when potential students are made to endure the submarine escape trainer. The trainer, which simulates the general arrangement of a 637-class submarine escape trunk, allows students to apply the egress training they learn in a basic classroom environment. This involves the Sailors forcing themselves, four at a time, into a cramped escape hatch that soon fills about neck-high with water. Then they each don a “Steinke hood,” an inflatable mask of sorts that allows the prospective submariners to breathe while ducking underwater to escape the tank from a watertight hatch that opens to a swimming pool. Once there, the Sailors assemble in a tight huddle pattern before making a final swim across the pool. One thing is for sure–if anyone in the class is claustrophobic, it won’t take long to find out. “That’s the last thing you want on a submarine,” said Information Systems Technician 2nd Class (DV) Curt Ramsey, one of the escape trainer instructors. “This ought to identify those who may have a problem with it. Between having the hood close over your face and the tight environment of the tank, no one should be able to fool us.” Despite the gripping fear caused by claustrophobia, Ramsey said most people who panic in the conditions are able to “rally up and finish the training. The sense of accomplishment is not allowed to last long, however. The following week, the escape trainer students class up for their official BESS kickoff. True to Bybee’s word, the typical day of instruction ran from 7 a.m. until 4 p.m. with an hour for lunch. During that time, the instructors made sure to pack as many lessons as possible in the student’s day. Learning all that information requires a longer than average school day for students. After taking a break around 4 p.m. to relax and eat dinner, nearly all students return to the schoolhouse at 6 p.m. for three hours of night study. Rare exceptions to night study are given to students who are excelling in the classroom. Add that to a 5:15 a.m. muster for breakfast, and BESS students know they are in for a long day. That night study comes in handy for the students during each of their three major tests during the course of the school. All Sailors in the school must pass the tests to complete the submarine school training. It’s only after conquering the escape trainer and running through the schoolhouse that the students are able to challenge rushing waters and burning fires. When the class reaches that point, the group splits into two and alternates a two-day period in each trainer. For each, the first day is purely a classroom day. Instructors use this time to go over basic scenarios and rules with the students. The second day of training is when all the action takes place. For students in the fire trainer, that means dressing out in full battle dress and going through several different firefighting scenarios, including the use of fire extinguishers, hoses, and self-contained breathing apparatuses. By the time the day is finished, the students should be able to combat the flames of various types of fires if the need ever arises. Those finished with the firefighting portion are only half done with the week, however. What awaits them in the wet trainer is more than 20,000 gallons of water spraying out of 12 leaks in a simulated arrangement of an SSBN 650-class lower-level engine room.